With increasing demands for more efficient tanker scheduling and greater loading / offloading availability, Offspring International offers Paladon Systems’ patented Autonomous Shutdown Valve (ASV). Fully autonomous and self-contained, the ASV offers terminal operators fail-safe offloading operations and greater system availability. 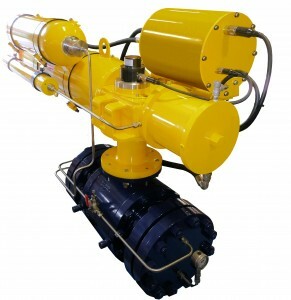 A self-contained subsea package, the ASV comprises of a PLEM valve, spring-return actuator and a long-life, battery controlled electric and hydraulic control system. When in operation, pressure from the pipeline to the terminal, or pressure from the subsea hose linking the buoy to the PLEM, is converted to hydraulic control pressure which is used to open the PLEM valve. Once pumping operations are completed, the drop in the pipeline’s pressure enables the actuator’s spring to move the PLEM valve to the closed fail-safe position. The valve closure speed can be controlled to suit the terminal. The ASV can be readily integrated within the Offshore Ops Terminal Management System allowing oil terminals to maximise terminal availability and efficiency, increase safety, reduce operating costs and reduce environmental incidents. Offshore Ops, working in partnership with Offspring International (OIL), offers industry leading software and technologies for mooring and offloading operations. Offshore Ops’ fully OCIMF SMOG 2015 compliant Integrated Terminal Management System has been systematically developed over 12 years to provide ‘live’ data on a wide range of operational and environmental factors, as well as effective operations management.